This review is going to be slightly different than my usual thing, because this book just inspires this type of feedback. Stories that make you smile so widely and so often your cheeks hurt, but in the best way possible. The kind of way you don't care because dammit, I really needed this. The kind of smiles that linger for entire scenes. That make your entire face scrunch up. Stories that show established couples just... being happy, living their lives, dealing with silly couple-stuff - not epic misunderstandings/angst/pain. Things you can relate to. Things that make your heart occasionally ache because of how normal and real they are without being overly dramatic or nerve-wrecking. Stories with couples who are fun, and funny, and teasing and you can't imagine them anymore apart than their friends can, because they are just that perfect for one another and you never once doubt their relationship. Their love. Their rightness. Stories that make you so damned jealous, because my god, you want to be carrots and peas with someone too! Stories with nerdy, sweet, messy, real guys that you can crush on and know you can also get in RL, if you look hard enough, because they're not made-up. They are not perfect. And in someway, that makes them perfect on it's own. Stories that make you feel like part of the gang, a friend to the characters. And as a friend, you see their good and bad parts and you adore them anyway. Stories that just... make you plain happy. So go get on it, authors. 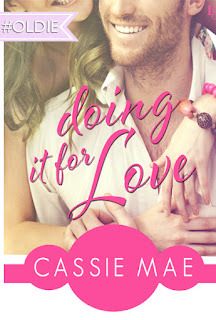 Cassie Mae can teach you a few things. And as for you, reader... if any of the above interest you - this a book you cannot miss out on. January Wrap Up | Giveaway! Why U No Give Out Five Stars?